Heat control window film is a very cost effective way to lower your cooling and heating bills. Energy saving window film has been used in office buildings and automobiles for decades. More recently residential window film has become available for home energy savings minded consumers. Window film is a thin layer or coating that can be applied on the inside glass surface of any window or door. As the suns heat contacts the surface, energy saving window film acts as a sunscreen to reflect and absorb the amount of heat that passes through the glass. There are dyed films that absorb and reflect solar heat considerably better than they insulate against heat loss. 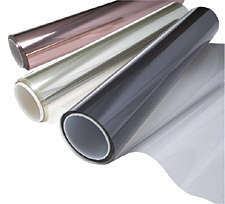 And there are metalized films that both reflect solar heat and insulate household heat very effectively. This coating technology allows for a transparent, clear and non tinting view from both inside and outside. Some energy saving window film have visible light transmission, or VT, ratings of 70% and some even higher. Meaning that while up to 72% of solar heat is being blocked, most of the natural sunlight is being allowed to enter the home. Energy saving window film will also improve you and your familys overall home comfort. So say goodbye to that unwanted heat during those summer afternoons and no more drafty windows in the winter time. Window film can also reduce that annoying glare on televisions, laptops and computer monitors. New glare control window film is designed to even further reduce sun glare, while still providing much needed heat control. Insulating window film is one of the most effective year round energy saving window treatment. This type of heat control window film can reduce heat gain during the spring and summer months by as much as 77% and retain up to 60% of household heat during the fall and winter months. that allows homeowners to save even more. enhance a homes curb appeal.